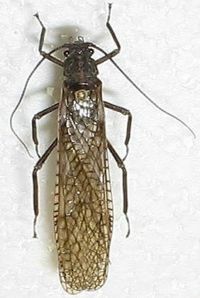 Plecoptera, or more commonly known as stoneflies, are insects that spend part of their life in the water as larvae. They do not tolerate pollution, and are excellent biological indicators. They mainly inhabit streams. As adults, they typically live only 24 hours, that way they can mate, and lay eggs. The larvae then hatch out, then after a certain time period and number of moults, crawl out of the water to moult for the last time, spread their wings, find a mate, and start over again. They can be kept in an aquarium as larvae. They require well oxygenated water. This page was last edited on 24 February 2011, at 08:03.